New MacBook Pro Design Leaked by Intel? Black Anodized Metal Enclosure – The laptop is all black, what’s that have to do with a Mac? Nothing for sure, but Apple.com recently revamped their website with darker menu bars, maybe this is a hint that we’ll see darker hardware enclosures in the future? Next-gen Intel Core Processors – The ad is for Intels new processors, and nearly every rumor about the next MacBook Pro line suggests they will use Intels latest Sandy Bridge Core processors. Noticeably Thinner Appearance – All signs point to the next MacBook Pro’s having a thinner enclosure, and the machine pictured certainly does. Aqua Interface Elements – Again referring to the Intel ad and the picture from Apple’s website, the interface elements are very Mac OS X like, with Aqua inspired buttons and sliding bars. There’s even the red/yellow/green traffic lights on the window bars. It Looks Like a Mac – If all else failed, the hardware just looks like a Mac, doesn’t it? This is obviously 100% speculation here, but at the very least, Intel’s advertisement has some Apple inspired elements to it. 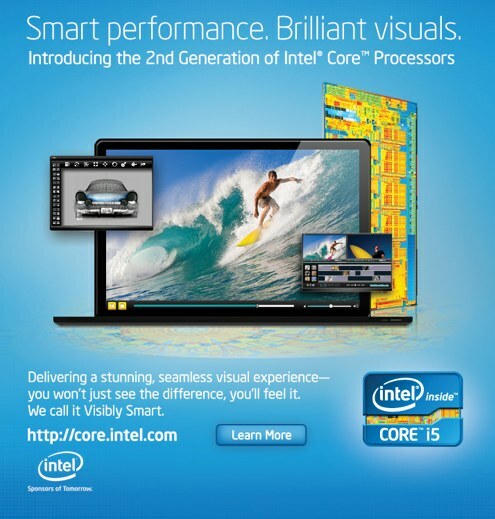 This ad/image was discovered by 9to5Mac, who also points out that Intel has spilled the Mac beans in the past. Most rumors peg a new MacBook Pro to be released sometime in the next two months, maybe even alongside a MacBook Air 3G, and most of those rumors suggest the next MacBook Pro will take some design cues from the MacBook Air to become thinner and lighter. But a black case? That would be very different from anything in Apple’s existing lineup. Could Intel manage such a massive leak? Whatever’s going on here, the laptop in the ad looks pretty fancy, but whether or not it’s a future Mac remains to be seen. Intel screwed the pooch again! Fingers crossed, it looks great! The front-right corner appears to have the same infrared receiver as the current MBP design. IR receiver plus the sleep light. Look at the lines on the machine too, looks so much like a MBP would. I think this could be it. It really looks awesome! Apple would freak, unless they wanted to generate a buzz themselves. Or, this might be another “left in a bar, found by someone” type of situations. The picture to the right kind of looks like iMovie. I’m buying if it is as good as it look. The size of it means most likely SSD disk and no DVD/CD. It better have Intel Light Peak with it to play Blue-Ray disk and they better come with External player soon too. I like the design but I do want a dvd player. I will never buy a laptop that does not have a disc player. I rather have it a few millimeter thicker and then with a dvd player. Really? Never? Would you never buy a computer with a floppy drive? Could be an envy? I’ve seen that sort of UI in a few video players kicking about for windows and nix. How about the little blown picture on the right of the laptop showing a video editing program that looks like final cut? How is that for a clue or hint ? It’s a Mac. Look at volume bar down, it’s a Mac bar. The same thing for the streaming bar. yup I’m metting my life on it that it will be the new Apple line for MacBook Pros. http://www.macdaddynews.com/wp-content/uploads/2011/02/liquidmetal_macbook_pro_mockup.jpg I will buy when it comes out. Every MacBook Pro should have their displays to fit exactly the 16:9 aspect ratio, which makes it great for watching widescreen TV shows or doing widescreen projects without even seeing the smallest blank letterboxes, as well as HDMI outputs, which makes it easier to project your MacBook Pro to the big screen without altering the display’s resolution if it’s exactly 1920-by-1080. They should also have embedded 3G/4G options, with flexible data plans from mobile broadband Internet services (i.e. AT&T, Verizon, Sprint, Clear, Time Warner, etc). Should Apple get rid of the optical drives, they would cost less not to have one, comparing to those who have, which adds more cost to it. Otherwise, a Blu-ray option, perhaps. Most importantly, every MacBook Pro should have Core i processors, and only Core i processors. Not the Core 2 for the 13-inch, but perhaps a Core i3 for starters. But, i dont think we shall get our hopes up here. Which i believe is from the same campagn. The picture shows another black computer with the same things on the screen, but this on is definitly not mac’ish.